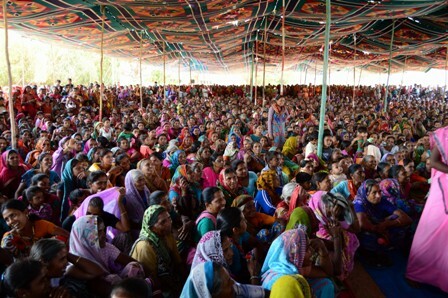 In Gujarat, India, 3000 women came together earlier this year with one very big aim. The women crowded under a makeshift tarp in the heat and the dust to listen to 24-year-old Artika give her first ever public speech. Why were so many women so keen to hear her speak? I’ll give you a hint: it wasn’t because Artika was a celebrity signing autographs; it wasn’t because she was a politician on the campaign trail or sporting star basking in adulation. Artika’s speech was far more important for these women than that. She was in Gujarat to help form the Indian Dairy Union’s first ever women’s committee. The meeting came about with the assistance of the International Union of Food workers after female dairy workers decided it was time they had a voice at their workplaces. The size of the meeting was a real indication of how important this committee is to these workers. It will give the women a platform to raise concerns they don’t feel have been discussed before. The committee will also give female workers a voice in ongoing debates. Wages, the price of milk, the amount of hours worked each day, safety conditions and drought are all big issues for the industry. But these issues don’t affect all equally or all in the same way. In forming the committee, these women were recognising that the impacts of these problems may be different for them than their male colleagues and their views may also differ. What they now want to do is to speak about the effects of long hours or low wages or the fluctuating price of milk on them and their children. They want to speak about what work safety means to a woman in the dairy industry. They want to be part of the decision-making processes at their work. The training to form this committee was funded by a group of 1000 women who attended the National Union of Workers International Women’s Day lunch in Melbourne at the start of the year. Each year we hold this lunch to raise funds to help educate and support women in the developing world understand and enforce their rights at work. As well as helping women in India’s Dairy Union form a committee, we have also funded the production of a booklet of work rights for migrant Burmese women working in the Thai Poultry industry. For us, this work has a very clear link to the work we do at home in Australia. Here we represent women who have been sexually harassed at work, dismissed unfairly or bullied because of their gender. We do this work because we believe all workers should be judged on the quality of their work and not their gender. But it’s important when we do this work advocating for the rights of female workers to fairness and equality, we recognise that this isn’t just an Australian issue. And it’s definitely not, as it is sometimes criticised for being, an elitist, developed world issue. Advocating for women to be given the equal opportunity to lead big corporations or even to lead our country is part of the same battle female dairy workers in Gujarat are fighting to have a say in how their work places are run. These fights might look different. They might be different stages of the battle. But the battle is the same. This means when we represent a female worker who has been unfairly dismissed in Melbourne and when we’re supporting female dairy workers in India, we’re equally working for all women’s rights to equal opportunity and fairness at work. Julie Warren is the President of the National Union of Workers (Victoria) and has been with the Union for over 16 years. During her time at the Union, Julie has been involved with organising in the Eastern suburbs and has recently has taken on the responsibility of Branch Trainer. Julie has had extensive involvement in vocational education throughout her career. Current appointments include Deputy Chair of the Manufacturing Skills Taskforce for the last 6 years. Julie is also a Board member of LUCRFSuper Community Partnership Trust. This entry was posted in Featured, World and tagged india, women's issues, womens rights, world. Bookmark the permalink.